To illustrate how government never reads the bills they vote on, a Texas lawmaker introduced a bill to declare a holiday to honor a serial killer for his contribution to "population control" and it passed. US lawmakers are often criticized for not even reading the bills that they vote on, but instead, voting along party lines or influence from lobbyists. Some of the most notorious cases of this in recent history were the passing of the Patriot Act and the following National Defense Authorization Act. In many cases, these bills are entirely impossible to read, consisting of hundreds or sometimes thousands of pages of tiny print and legalese, combined with a limited amount of time to decide and vote on the bill. However, this is a problem that has been going on in Congress for generations and one lawmaker pointed it in a most epic way. On April Fool’s Day of 1971, Texas State Rep. Tom Moore proposed a prank resolution honoring a serial killer…and it passed. 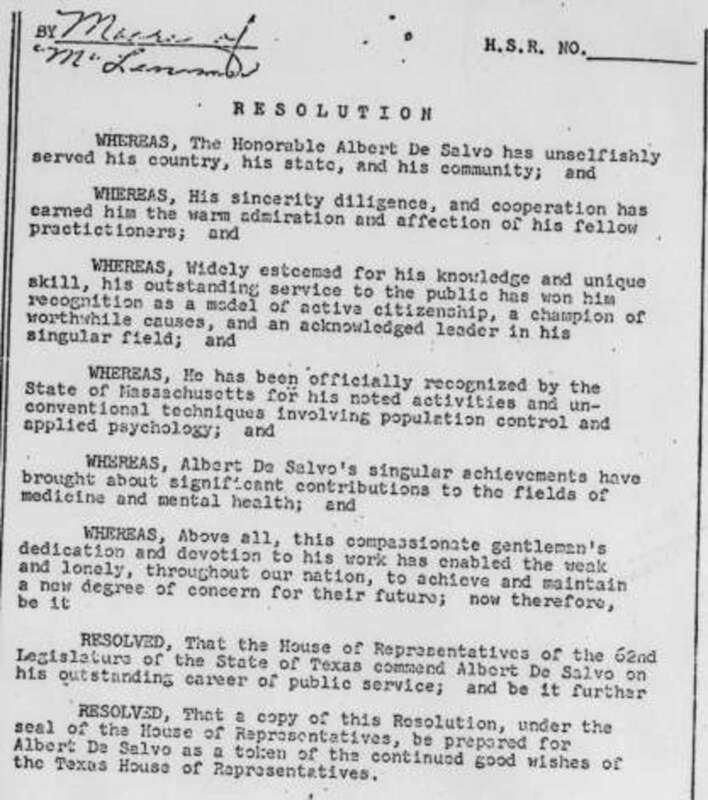 The resolution officially honored the Boston Strangler for his “unconventional techniques involving population control,” but used his lesser known legal name, Albert De Salvo, instead of his infamous media moniker. De Salvo confessed to murdering 13 different women in the Boston area, in the early 1960s. “The Honorable Albert De Salvo has unselfishly served his country, his state, and his community. His sincerity diligence and cooperation has earned him the warm admiration and affection of his fellow practitioners,” the resolution began. While it seems obvious that this was a stunt to prove that politicians don’t even read the laws that they vote on, Moore claims that this was nothing but an innocent April Fool’s Day prank. “Yes, it passed, but nobody got mad. It was an April Fool’s joke, but it made the press in a different light,” he told the AP. Moore reportedly withdrew the resolution before it officially became law, so there isn’t a current law on the books honoring the Boston Strangler. However, this is still an important lesson on how government works behind the scenes. Even if Moore didn’t truly set out to make a point, which is highly doubtful, the case was proven. It is more likely that he was initially trying to take a stand and then forced to back down behind the scenes when the story made headlines. Either way, this proved that politicians will vote on completely ridiculous laws and resolutions that they have never even read. Even more alarming is the fact that this resolution was only a page long and took only a few moments of time to research, while most of the bills to pass through Congress are long, complex and confusing. This situation is so commonly known that there have been numerous attempts at passing legislation to force lawmakers to read the bills they vote on, but since the fox is guarding the hen house all of these resolutions have failed.